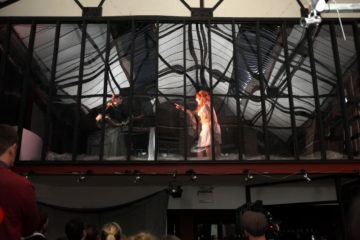 Location, Location is a site-specific immersive theatre piece which auctions the performance space. Audience members, unwittingly cast as prospective buyers, are offered the chance to clasp their claws on the deal. In the attempt, they learn the grim past of the property from the tragi-comic stories of the ghosts of its previous tenants. Characters and script are based on famous operas. Location, Location was first performed in April 2013 by Odd Eyes Theatre’ Stage Acting Members and successfully performed in the basement of Mostart in Stoke Newington to a very cosy audience of one hundred. In November, Location Location was scaled up and remounted selling out over a long Halloween week end. Two casts of 22 emerging performers took over Stour Space, a converted factory now art gallery overlooking the Olympic Stadium, and its surrounding streets in Hackney Wick. Over a long Halloween weekend, the collaborative event merged live performance with music by Reel Rebels Radio DJs, street theatre and art installations. This is first of three clips from the award winning Location, Location (Unltd & Big Local Area award). This film is from the Halloween 2013 performance created at Stour Space, Hackney Wick. Have you got a great space for a ghoulish site-specific event? Contact us for more information about Location Location and to arrange a meeting.